Monday was a great day for me. For one – I was finally mobile again after rigor mortis settled in from Saturday’s WOD. Seriously couldn’t walk down stairs on Sunday without pain being involuntarily verbalized. Props to my partner Michelle – not sure what the split was on the 250 walking lunges – but I know she carried the load more than I did. On Monday I was so happy to be able to walk without the need to stifle profanities, and I was even happier to find out the WOD would be Helen. 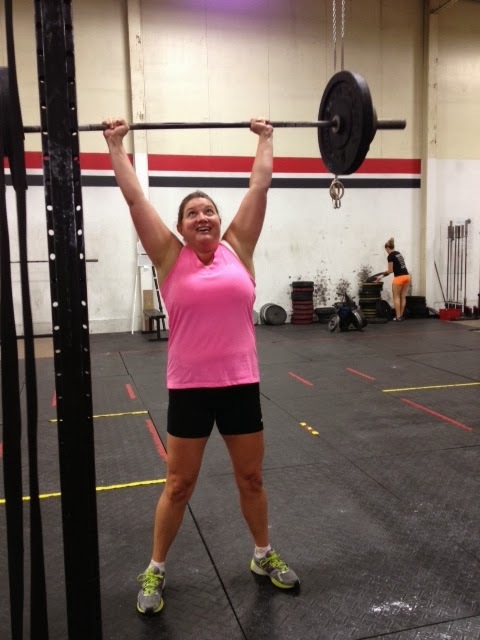 When I was going for my second Push Press – another classmate Terri took a pic. Now here’s the thing about this pic. I was such a badass in my own mind at that moment, but the pic proves that I am indeed still a dork. But the reason I love this pic, and why I’m sharing it here, is because it really captures the moment of achievement. I’ll always remember the classmates that were encouraging me and rooting for me. Helen wasn’t the only nice gal at C3 that night!